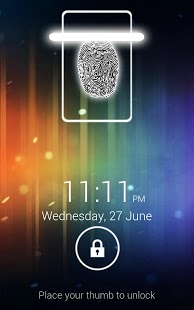 Now you can lock your screen and use your fingerprint to unlock your screen and Fingerprint Screen Lock ICS is the best fingerprint lock in the Google Play. 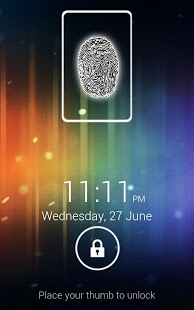 Simply run the finger print lock app and you will get the screen locked mode and it looks very attractive and it shows you current time and date with the same look and feel of Ice cream sand witch OS. Fingerprint Screen lock is designed for all the HD devices and supports all the other android devices as well. Show your friends that your device works as biometric fingerprint scanner. – Used ICS features and looks. – Best image qualities with optimized device compatibility. – Professional looking and works with all HD the devices. – New tricky way to unlock your device. HOW TO UNLOCK( THE TRICK) : Place your finger on the scanner and hold it. Then lock icon starts blinking, count the blinks and once it completes 4 blinks release your finger and fingerprint screen lock will be unlocked. Your friends do not know the trick , you can simply pretend that it works only for your fingerprint. Note! – Fingerprint Lock app does not actually scan your fingerprint and it’s obvious that phone screen cannot be used as a biometric fingerprint scanner for now. Fingerprint lock lite version works as screen lock and disables your back button, you can fool your friends by simply saying it works like a real biometric fingerprint scanner. Click how to use button and it explains how to use the fingerprint lock screen app and how to unlock it. Fingerprint lock free is a fun app and develper is not liable for any actions involving the use of this app and can not guarantee that it works as a security measure,phone lock or a screen lock, it’s just for fun, I can gurantee that it won’t do any harm to your device and enjoy with your friends. Now you have an option to set the lock as default or not.. go to settings and customize as you want.